Crimes like home burglary and robbery are kind of the things we get to hear about almost on every alternate day. Mostly these crimes are often a matter of convenience. Moreover, these home burglars often stake out a housekeeping a track on the inhabitants, thereby predicting their presence. People who are often away on business trips or those who have a busy schedule should be cautious in order to prevent home break-ins. Try to put a hold on your letters and emails. As an overflowing mailbox could be an indication of your absence to burglars. Have someone to maintain the levels of snow or the lengths of lawns around. So, none can assume your absence for a long period of time. Inform the local police department of your non-availability as they could drive by anytime to make sure nothing unusual is occurring. Ask neighbors you trust to make sure no one is walking around your property or inside your home while you are away. Make sure you have the best home security system up and working in its best way. Do not forget to test your home alarm system. Consult a professional if needed. Consider installing a video surveillance system as it would allow you to see your home from thousands of miles away simply by using your mobile or device. It is important to have a home monitoring system professionally installed, to ensure that you do not miss out on any of the benefits or privileges. Use outdoor lightings to your advantage as this would help you as a theft deterrent. Motion activated lights are ideal to scare off trespassers. Covering up your window would help you avoid break-ins and theft. Usually, home break-ins area matter of convenience even-though some are planned in advance. Hence, make sure that people passing by cannot see the valuables inside your house. Explore Z-Wave technology to control interior lightings as that would schedule indoor and outdoor lights to go on and off throughout the property in varying rooms at different times of the day. Have someone park in your driveway time in and out, to make it appear that someone is home. Or you may even ask a good friend or family member to drop down every now and then to keep a check on the house and also maintain it a bit in your absence. 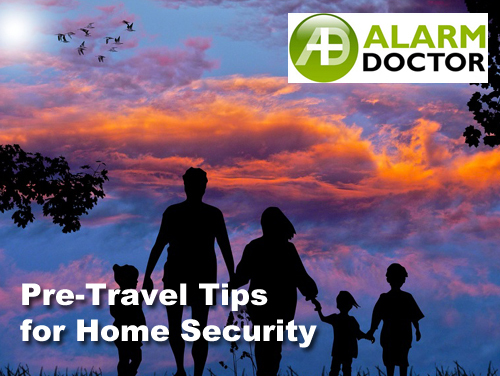 Hence, if you are traveling frequently, these 10 above-mentioned tips might help in ensuring the safety of your home and belongings. So, try them out and share with others as well. Christmas and New Years Eve is just around the corner and you must be excited for the holidays and some of you might also be planning a vacation. But before you leave for one with your family, it’s crucial for you to keep in mind the security and safety of your home or other properties. Telephone Ringer: Make sure the volume of the telephone ringer is turned down so that anyone from outside the house can’t hear it ringing for long periods of time. Door and Windows: Make sure all the doors and windows are properly locked and well maintained. Alarm System: Use a good quality alarm system to keep your home safe from any potential break-in by the burglars. Make sure the alarm system is kept on when you are leaving for the vacation and place a signboard about the same in front of your home to discourage the burglars. Sensor Lights: Make sure the sensor lights at the exterior are kept on. Timers for lights and radio are set to turn on and off in different rooms at times that match night and day patterns so the casual observer thinks someone is home. Vehicles: Make sure all the vehicles that you are leaving at the home are kept safe and secured and their respective keys should also be kept secure. Power Supply: Ensure to disconnect the power supply to the door of the electric garage and the door connecting the garage and your home is locked properly. Cancel deliveries: Make sure to cancel the deliveries to the house, for example, newspapers or other everyday subscriptions. This will not let the stuff to pile up in the porch of your home again indicating that you were not home for many days. Social media: Don’t announce every single detail on social media by writing a post or sharing too many family pictures especially if nobody is home. Thieves can get a fair amount of idea from your travel posts from social media and this might give them a fair chance to break in while you are out. Arrange for a trusted neighbor: Ask a trusted friend, neighbor or any relative to keep a check on your home while you are away for a few days with your family. This will ensure that you enjoy your time with family well without any worries about your home security. Don’t hide keys outside: Make sure you don’t leave an important key to your house hidden in the usual hiding places in order to keep your home safe. Burglars have a fair amount of idea about your moves especially when they are keeping their eyes to break into your property. In the end, stay safe and keep your home extra safe using the above safety tips before you plan a vacation with your family.